DIGITAL autopsies have been used in several high-profile cases including the recent assassination of Kim Jong-nam. 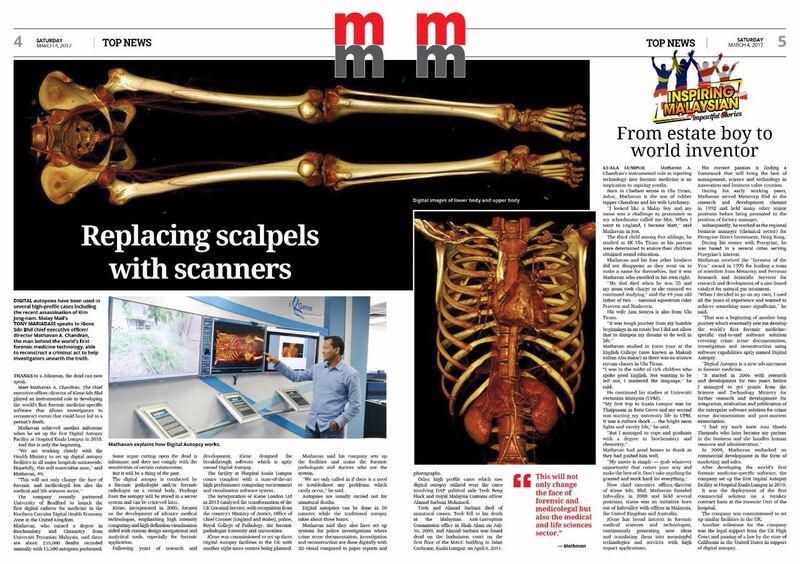 Malay Mail’s TONY MARIADASS speaks to iGene Sdn Bhd chief executive officer/director Mathavan A. Chandran, the man behind the world’s first forensic medicine technology, able to reconstruct a criminal act to help investigators unearth the truth. THANKS to a Johorean, the dead can now speak. Meet Mathavan A. Chandran. The chief executive officer/director of iGene Sdn Bhd who played an instrumental role in developing the world’s first forensic medicine-specific software that allows investigators to reconstruct events that could have led to a person’s death. Mathavan achieved another milestone when he set up the first Digital Autopsy Facility at Hospital Kuala Lumpur in 2010. “We are working closely with the Health Ministry to set up digital autopsy facilities in all major hospitals nationwide. Hopefully, this will materialise soon,” said Mathavan, 49. The company recently partnered University of Bradford to launch the first digital cadaver for medicine in the Northern Corridor Digital Health Economy Zone in the United Kingdom. Mathavan, who earned a degree in Biochemistry and Chemistry from Universiti Pertanian Malaysia, said there are about 155,000 deaths recorded annually with 15,500 autopsies performed. Some argue cutting open the dead is inhumane and does not comply with the sensitivities of certain communities. But it will be a thing of the past. 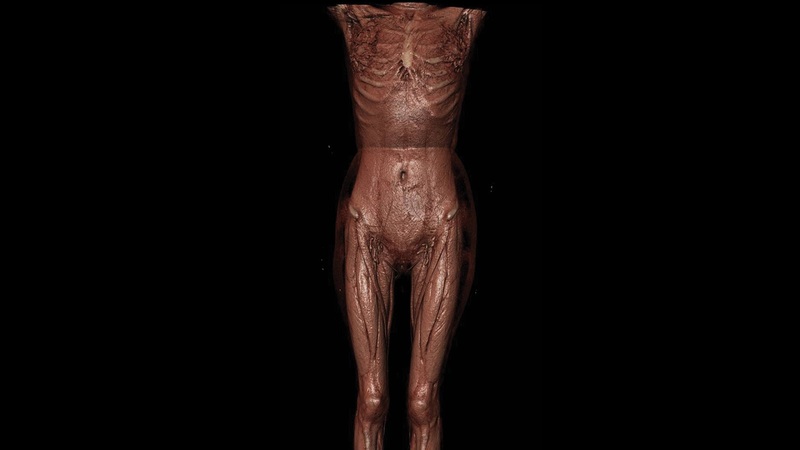 The digital autopsy is conducted by a forensic pathologist and/or forensic radiologist on a virtual body. Findings from the autopsy will be stored in a server system and can be retrieved later. 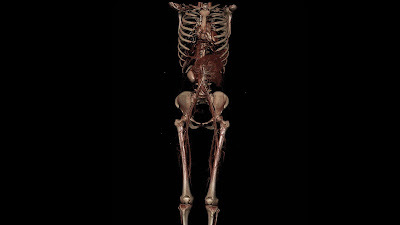 iGene, incorporated in 2005, focuses on the development of advance medical technologies, emphasising high intensity computing and high definition visualisation aided with custom design navigational and analytical tools, especially for forensic application. Following years of research and development, iGene designed the breakthrough software which is aptly named Digital Autopsy. The facility at Hospital Kuala Lumpur comes complete with a state-of-the-art high performance computing environment and visualisation software system. 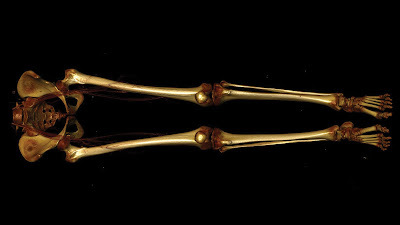 The incorporation of iGene London Ltd in 2013 catalysed the transformation of the UK Coronial Service, with recognition from the country’s Ministry of Justice, Office of Chief Coroner (England and Wales), police, Royal College of Pathology, the forensic pathologist fraternity and universities. iGene was commissioned to set up three Digital Autopsy facilities in the UK with another eight more centres being planned. Mathavan said his company sets up the facilities and trains the forensic pathologists and doctors who use the system. “We are only called in if there is a need to troubleshoot any problems, which rarely occur,” he said. Autopsies are usually carried out for unnatural deaths. 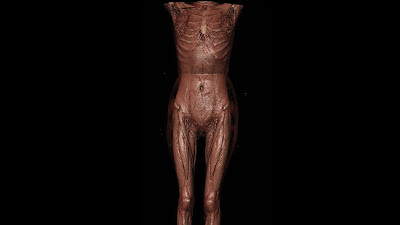 Digital autopsies can be done in 30 minutes while the traditional autopsy takes about three hours. Mathavan said they also have set up systems for police investigations where crime scene documentation, investigation and reconstruction are done digitally with 3D visual compared to paper reports and photographs. Other high profile cases which saw digital autopsy utilised were the cases involving DAP political aide Teoh Beng Hock and Royal Malaysia Customs officer Ahmad Sarbani Mohamed. Teoh and Ahmad Sarbani died of unnatural causes. Teoh fell to his death at the Malaysian Anti-Corruption Commission office in Shah Alam on July 16, 2009, and Ahmad Sarbani was found dead on the badminton court on the first floor of the MACC building in Jalan Cochrane, Kuala Lumpur, on April 6, 2011.